Check out these simple starters for your holiday gathering that won’t have you spending extra hours in front of the stove! The holidays are almost here which means soon enough family members from all over the country will be traveling to your house for some food, family time and fun. Preparing food for the holidays is a big job, especially if you have a large family, but let’s face it, the holidays are hectic enough without having to worry about putting together complicated appetizers for your holiday gathering. This year, instead of spending all of that extra time slaving away in front of the stove, why not opt for some quick and easy, classic appetizers! Directions: Begin by thawing your spinach. The best way to thaw the spinach is to take it out of the package, put it in a Ziploc bag, and soak in hot water until its thawed and then drain. Mix together the mayo, sour cream, onion soup mix, water chestnuts and chopped spinach. Let chill overnight. Don’t forget to buy tasty tid-bits to dip in the spinach dip, like sourdough bread, tortilla chips or fresh vegetables. Directions: Begin by preheating the oven to whatever temperature the crescent rolls container says. Take the crescent rolls out of the container; they should look like triangles when you peel them apart. Cut the triangles into smaller triangles, 2 mini triangles for every 1 triangle you peel off the group. Then roll one miniature hot dog into each mini triangle. Cook for 10-15 minutes. Be sure to check on the hot dogs after 8-10 minutes in case they start to burn on the bottom and need to be flipped. Directions: Boil eggs for 10-12 minutes. Afterwards cool eggs under cold running water. Once cool, peel the hard boiled eggs and rinse off any excess shall pieces. Slice the egg in half, scoop out the middle yolk and place the egg whites to the side. Take your yolks, mash them up then add in mayo, mustard and salt and pepper until smooth. Refill the egg whites with this concoction then sprinkle on some scallions. Directions: Once you get your fresh wings home from the butcher begin by cutting them at the joint and cutting off the tip. Wash the wings, dry them and fry them in approximately ½ inch of vegetable oil. Once they start to brown flip them over and repeat. Once cooked removed the wings from the oil and drain out the excess oil on a paper towel. 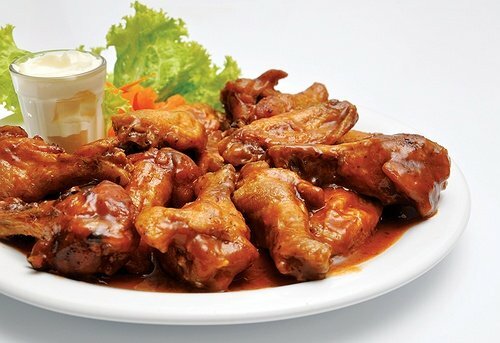 Transfer the wings to a big bowl then cover them generously in your favorite hot sauce, barbecue sauce, etc. Add some salt and pepper and mix. Lastly, serve with your favorite dip. Celebrating Easter, Entertaining and Teaching Kids, Events, News & More in April 18th's Newsletter! Subject: LongIsland.com - Your Name sent you Article details of "Easy Appetizers for Holiday Entertaining"